The good news, according to CNET, is that a new “fast-ring” test version of Windows, Insider Preview Build 17760, no longer interrupts the installation of rival browsers. Can you remember old Internet Explorer (IE) browser in the first browser wars two decades ago? That was the time when IE dominance got Microsoft in trouble, with the US Justice Department and the European Commission dragging the company through antitrust proceedings. 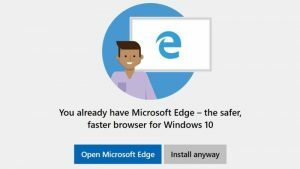 Today, Edge – the “safer and faster” browser is struggling to reclaim even a shadow of the dominance it once held with its IE browser. According to StatCounter, the worldwide browser market share is dominated by Chrome (60%) while Edge remains at a dismissive 2 percent! This entry was posted on Tuesday, September 18th, 2018 at 1:56 pm	and is filed under Windows 10. You can follow any responses to this entry through the RSS 2.0 feed. You can skip to the end and leave a response. Pinging is currently not allowed.